MPEG-1: Supports Audio Layer-3 sampling frequency 32kHz, 44.1 kHz, 48 kHz, Bitrate 32 Kbps ~ 320 Kbps. MPEG-2: Supports Audio Layer-3 sampling frequency 16 kHz, 22.05 kHz, 24 kHz, Bitrate 16 Kbps ~ 160 Kbps. Equipped with 3 remix assist functions (Jet, Zip and Wah) and a Digital Jog Break dial, a new remix world can be experienced. By operating the jog dial in time with the music, you can create original sound effects. A large 3.9 inch diameter jog dial enables quick and easy corrections to uneven beats with only a touch. This function changes the music tempo depending on the direction and speed the jog dial is rotated. Moves the pause position in frame units (1/75 sec) when the jog dial is rotated in the pause mode. By turning the jog dial while holding down the manual search button or the track search button, disc searches can be performed faster than normal search or track search functions. 3.9 inch long, high-precision slider allows for easy tempo adjustment. With a digital display calibrated in 0.02% units (within a +/- 6% range), tempo adjustments can be made more easily and accurately. The maximum range can be set to three variable ranges; +/- 6%, +/- 10%, +/- 16%, to provide easier operation environment. Maintains the same pitch of sound while changing the music tempo. After storing a cue point in memory, press the CUE button while playing back a track to return and start from the stored cue point. Skips the non-recorded part at the top of a track and automatically enters stand-by mode at the track’s starting point, allowing playback to begin instantly when the PLAY/PAUSE button is pressed. Playback can be started at one touch from a stored cue point, convenient for confirming start points and as sampler. This function simplifies the setting and cancelling of loops. The loop can be set at the very instant the track is being played. By setting a loop just before the end of the track, the track can be made so that it doesn’t stop. In addition, an ADJUST mode has been added to enable one-touch adjustments to the loop-out point, thereby facilitating the loop operation. Allows returning to the set loop position at any time. Press the RELOOP/EXIT button after cancelling loop play to return to the loop start position. By using the loop ON and OFF combined with the rhythm of the track, new sound effects or live remixes can be created. The bar graph provides a visual reference of the track playback progress that enables the user to visualize the current playback position, in the same way as is done with an analog record by checking the position of the needle. The current position can be confirmed by the length of the graph, and in addition, the graph flashes to signal the ending of the track. The disc can be inserted without the opening of trays and doors, making possible quick disc changes. By connecting this unit to DJ mixer DJM-500, DJM-600, DJM-300, DJM-3000, DJM-909, or DJM-707, QUICK START and BACK CUE functions can be performed by using the mixer’s fader function. 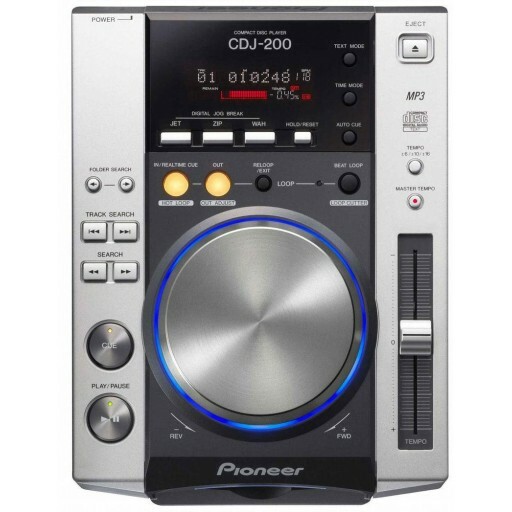 Two CDJ-200 units can be connected in tandem to perform automatic relay play. When track playback stops on one of the players, the standby mode of the other player is released and playback begins automatically. OIL DAMPER FLOAT construction helps resist shakes and impacts. This unit features an OIL DAMPER FLOAT design, making it harder for distortions and sound breakup to occur due to impacts from operation and vibrations from the floor. Displays CD TEXT on CD TEXT-supported discs.